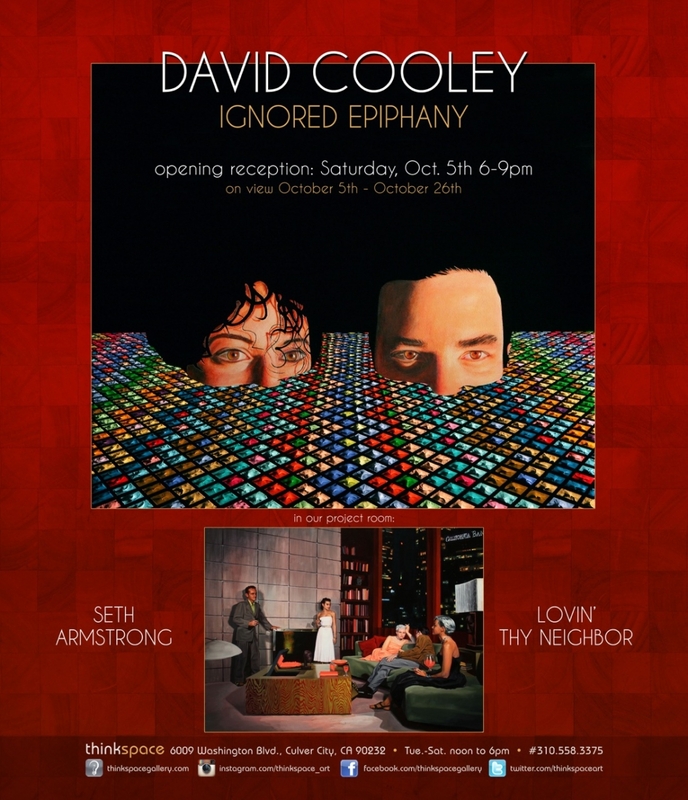 Thinkspace is pleased to present Ignored Epiphany, featuring new works by mixed media artist David Cooley. 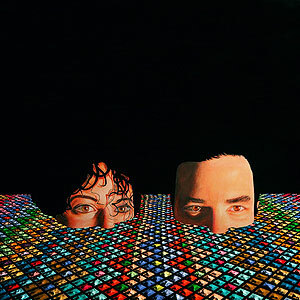 Cooley’s work reconciles a feeling of visual chaos with the strategic restraint of composition. Combining abstract geometry and recognizably rendered imagery – everything from hot air balloons, swimming pools and ice cream cones, to statuary and landscape – the artist’s work is psychedelic and visionary. Cooley’s pieces are fearlessly experimental, both visually and materially, and truly seem to offer the viewer a visual revelation of sorts. Seeing the work for the first time is like looking into a kaleidoscope; we’re offered a scopic view that challenges our assumptions about what is visually possible, all the while enjoying the delight of their fantasy. Whimsical and undeniably vertiginous, these works capture perspectival transition and movement in a way that suggests a deliberate orchestration of formal relationships. Beneath the seeming chaos of it all is a mastermind carefully controlling the matrices of this mesmerizing universe. Unique to Cooley’s mixed media work is his incorporation of pattern from found fabric and textiles, and his superimposition of perfectly strategic sections of impasto paint “spikes”. This unlikely combination of pattern and imagery is at once dizzying and revelatory, and produces unexpectedly phenomenal results. Cooley juxtaposes surrealist imagery, with this decorative patterning and these meticulously applied textural geometries to play with depth, perspective and visual dissonance. Optically fascinating, and slightly disorienting, the work embodies the coexistence of seemingly contradictory states: chaos and resolve in complete, absurd harmony. One has the feeling that the paintings shouldn’t work, but they do, therein lies the delight of Cooley’s vision. The artist’s material practice is entirely his own. Working with a combination of media that includes resin, fabric, acrylic, and spray paint, the works are simultaneously textural, optical and sculptural. playing with the visual legacy of op-art, but in such a way as to re-introduce recognizable materials, unexpected imagery and intensely colorful palettes, the work defamiliarizes the known and pushes the boundaries of our expectations. Cooley fearlessly, and unapologetically, pushes the paradigmatic restraints of painting and sculpture, and challenges us to see again with fresh eyes.